Jason and Artemis are in a bar filled with a crowd that aren't exactly law abiding, stand up citizens. They want information that may lead Artemis to her much coveted prize, The Bow of Ra. 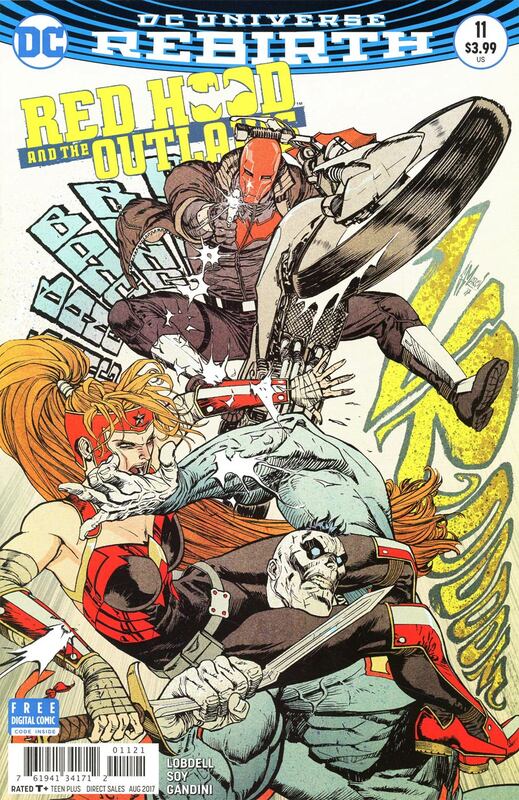 Naturally a fight ensues, and Redhood and one half of his Outlaws make short work of the patrons of the bar. During the battle, Artemis gets rattled at the site of someone from her past. Turns out a psionic shape-shifter named Stirk, reached into her mind and pulled up an image of an Amazonian woman named Akila. Many years ago, a young Artemis and her best friend Akila hone their skills in battle, to be the absolute best that they can be. Artemis has aspirations at becoming a Shim'tar, which are a champion and protector of the land, the land being Bana-Mighdall, a colony of Themyscira. One day Akila disappeared, and in the weeks that followed, Artemis searched night and day for her. Until one day she reappeared. Artemis took her home and nursed her back to health, in her heart she knew that the Gods had summoned her, and that she had changed, she had become the Shim'tar. Duty bound, Akila couldn't speak of it to Artemis, and she left to fulfill her duties. In the meantime, Artemis found peace in the solitude she was left in without her best friend. Until one night it all came to an end. Bana-Mighdall was surrounded by a mystical sandstorm, just as Themyscira/Paradise Island was surrounded by a mystical fog that kept the outside world out. The neighboring hostile nation of Qurac somehow managed to break through the sandstorm and attacked Bana-Mighdall. Shocked at all the death and destruction, Artemis comes across a battle worn Akila, worse she is wielding the Bow of Ra. Also at the site all the destruction is Princess Diana of Themyscira, known to the rest of the world as Wonder Woman. Artemis and Wonder Woman have a short fight, until Wonder Woman puts a stop to it, and explains to Artemis that she only came to help, but once she arrived, she found that all the death and destruction was caused by one of their own... Akila! Akila had used the Bow of Ra against the invading forces of Qurac, and its power caused the destruction of Bana-Mighdall also. Wonder Woman explains to Artemis that Akila is now an empty vessel, and that her best friend is gone. The two Amazons take her down, and Akila lies in Artemis arms, with her dying breathe she apologizes to Artemis and tells her, that "she should never had listened to them, and she was never the Shim'tar... that Artemis was". Artemis and Wonder Woman thought The Bow of Ra was lost in the conflict, but they were "both wrong". Jason understands now why it is that Artemis searches so hard for the mystical weapon, and the two leave the bar, with their new mission for their time firmly in mind. Artemis having discovered that the Bow of Ra is being used to destroy an entire city, she and the Outlaws race to the nation of Qurac to discover the identity of the wielder of the bow. They find out that it is non-other than Akila, Artemis former friend and sister. On their way to Qurac in a make shift transport courtesy of Bizarro, The Outlaws are shot out of the sky by the Bow of Ra, the trio find themselves stranded and separated in the nation of Qurac. While Artemis squares off against her former sister in arms, who is responsible for the Bow of Ra's disappearance, Bizarro comes across a group of innocent refugees looking for a savior. A role that is almost alien to him, but one he falls into as if it were in his very being. Meanwhile Jason is imprisoned and tortured by the ghosts of his past, as he relives the trauma of his own death and comes face to face with his greatest enemy...himself. In usual Jason Todd fashion, he overcomes his anguish, and returns to Artemis side to aid her in her struggles. After Akila resurrects an army of fallen Amazon warriors whose mission it is to destroy Qurac, Artemis finds herself at a cross roads, either fulfill her destiny as the champion of Bana-Mighdall, which has been her sole purpose for a long time or stand by her new her friends. She of course chooses the side of her outlaw team mates and together they help bring down Akila. Artemis uses the bow on Akila, which takes her down, no longer able to control the power within her, she begins to go nova, as she is dying, Bizarro takes her in his arms and fly's upward, where her body destroys itself in a giant fiery explosion. Bizarro manages to make it back to Earth, but is severely weakened and falls to the ground. His heart stops beating, and it appears that he has died. Story - 5: This book has been a favorite of mine since Rebirth began. I love the story that Lobdell has managed to tell so far about this Dark Trinity. 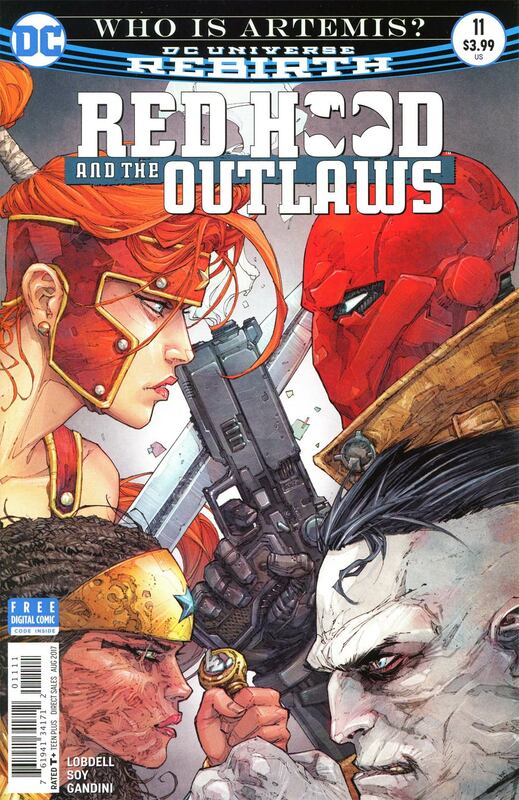 Jason being the main protagonist obviously is at the forefront of the Outlaws team, but these few issues, focusing on Artemis, don't just serve as updates to her origin, but also help gel this trinity together as a team, and somewhat family unit. Artemis story fits in rather well with the new updated Wonder Woman in this Rebirth era, and introduces us to a modern update of her mythology, it's great for whoever is not following her exploits. I really liked that Lobdell didn't let Wonder Woman take over the story, and kept her involvement to the flashbacks in issue #8. Unlike Batman, who turns up a little more regularly! Lobdell I feel does great with secondary and tertiary characters. His Superman run in the New 52 was heavily criticized, though I enjoyed the first arc of that. His true strength for this book is that he can freely explore different takes on these characters, and come up with different yet familiar elements to which the story can pull from, and direct the course of the series. Artemis role as a Shim'tar, and her quest for the Bow of Ra, has directly lead into what will happen with Bizarro next. It's this type of storytelling that I gravitate to the most. I'm glad that they have moved away a little from the formula of 6 issue arcs for the trade paperback. Lastly I want to mention the psychological aspect of Jason Todd. Like other members of the bat family, he certainly is driven in his quest, but his has always come from a checkered past, even before he became Robin. And with the trauma of his death and resurrection, he is a damaged character that is in constant battle with himself. This concept is not new by any stretch, Marvel has done this with Wolverine for many years, and I just like the way Lobdell tells the story of such a character as Jason Todd. Jason is essentially a Ronin, even though Batman was his mentor before his death and resurrection. Now with the addition of Artemis and Bizarro, this Dark Trinity is such a compelling read, with so much possibility for the future. I am still holding out for the issue that Superman will finally appear in, and we know there will surely be a showdown with the Trinity. Art - 5: Issue #8 featured the awesome art of one of my favorites, and Redhood Alumni, Kenneth Rocafort, even though it was a prelude chapter to this new storyline, his art was a welcome surprise, and always a joy to behold. I've always been a fan of his unorthodox style, especially that he is not beholden to traditional style panel work, and he "draws outside the box". The Artemis and Akila scenes were awesomely rendered, with good pacing from the training scenes to the more subtle moments of the two conversing. Also was good to see Rocafort's rendition of Wonder Woman. His style still has a very Image/Top Cow feel to it. Look forward to seeing more of Rocafort in the future hopefully. Dexter Soy is back with issue #9, and as always, he bought his best to each page. Soy has really set the tone for this book, with his use of heavy blacks in the shadows and cinematic panel work. It feels like a CW show. Think along the lines of Arrow and Supernatural. As I've stated many times in past reviews, I really enjoy Soy's line style. It has a lot of kinetic energy. It looks almost like animation stills. Like the splash page in issue #9 with Bizarro blasting his Ice-Vision at the fighter jets. That is my favorite page the issue. Speaking of Bizarro, his intro this arc, in the opening page looked epic, as he flew the old plane with one hand. I love that there is a Superman style pose there, yet he is still a different entity from his progenitor. With the limited amount of Bizarro in this arc, Soy did a good job of drawing his raw power, and what he brings to the team. Jason/Redhood looked incredibly cool. Soy's version of him could look like he fits right on at home on a CW show, as I mentioned before. I also love how Soy has designed his Redhood helmet to open up with a visor, it looks very similar to the RDJ Iron-Man Helmet. In regard to Jason in the story arc, the visuals of his past haunting him were great. It was interesting to see Jason interact with his hallucinations of the Joker. I can only imagine what the script from Lobdell would be like, but Soy managed to expertly bring his script to life. And finally Artemis, Soy captured her sorrow, frustration and anger so well during these issues. I like the flash back scenes of her and Akila. He really built on what Kenneth Rocafort established earlier. The battle between her and Akila was filled with so much emotion and rage, it leapt off the page. My personal favorite image was the moment that Artemis finally calls her axe "mistress" to her hand, as she gets ready to battle Akila for control of the bow, it was a real "things just got real" moment. One day I'd hope to see it play out in animation. As I mentioned before, the art captured all facets of Artemis personal struggles throughout the arc, and with the style being a hybrid of Anime and an almost Frank Miller thick shadowesque, it didn't become campy looking or as others describe as "too cartoony". As always, the colors are amazing, they capture the moodiness of the world the Outlaws call home, Veronica Gandini really enhances Soy's art in a fantastic way. Cover Art - 5: As always, I like the main covers over the alternate ones. Kenneth Rocafort provided 3 of them, where Nicola Scott did one. Good compositions, they serve the issues well.